Former Vikings and Cardinals head coach Dennis Green has passed away, as Adam Schefter of ESPN.com tweets. Green was 67 years old. Green, who played running back at the University of Iowa, began his coaching career as a college assistant after a short playing stint in the CFL. Green climbed the college ranks in the 70s and got his first NFL break in 1979 when he became the 49ers’ special teams coach. After that, he returned to the NCAA to serve as Stanford’s offensive coordinator and as head coach at Northwestern. After returning to the 49ers as wide receivers coach and a two-year run as the head coach at Stanford, Green was hired as the Vikings head coach prior to the 1992 season. Green, who was only the third black head coach in NFL history, guided the Vikings to the playoffs eight times in his ten seasons at the helm and only saw a losing record in 2001, his final season in Minnesota. After ten years of dealing with the NFL grind, Green spent two years as a broadcaster with ESPN. 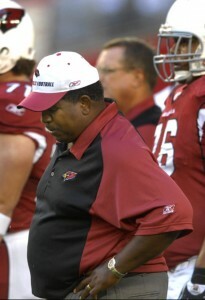 He returned to football in 2004 when the Cardinals hired him as head coach. Unfortunately, Green did not enjoy the same on field success in Arizona as he did in Minnesota and he was dismissed after the 2006 season. In total, Green went 113-94 as an NFL head coach and his teams posted a combined 97-62 record with the Vikings. Putting his accomplishments aside, Green will be remembered as a fantastic motivator and all around great person. We here at PFR extend our condolences to Green’s friends and family.